Horsepower and torque, it’s an interesting subject that a lot of people have pushed about in many an automotive forum: Carroll Shelby once said: “Horsepower sells cars, torque wins races”. We’re not going to go through all the equations and physics of how horsepower and torque is calculated, not only is it difficult to explain in writing, it confuses the hell out of most people. Unless you plan on being a specialist engine technician, it’s just too much. But we will try to explain what they are, how they relate to each other and how it affects your cars performance in the simplest way we can. The term horsepower was first used on engines by James Watt, a British inventor, who was associated with steam engines. James Watt used the term to measure steam engine power to the power from a horse. Horsepower is the rate at which work can be done (over a given distance). A horses’ workload was measured to calculate a starting figure for the measurement of this power. Incidentally engine power can also be measured in kilo Watts (kW) and (PS) pferdestarke which is German for horsepower. The familiar Brake Horsepower (BHP) means that power was measured using a dynamometer. BHP is measured at the crankshaft. Car manufacturers, normally quote this as ‘peak’ horsepower (the maximum horsepower possible at a given rpm). Horsepower is a measurement calculated from the engines torque which is multiplied by a given RPM and then divided by 5252. 5252 is the figure used for the calculation; it is a constant and unless you want to be bored/confused, just take it from me. We were going to mention rolling road dyno’s, but due to the differences from one dyno tuner to the next, feel you are best off seeking advice from the tuner themselves. The main reason we’re not going to mention anything here is the many ways in which the dyno tuners adjust the figures to calculate for drive loses. Also remember the car is stationary and not on the open road, with air pressure, temperature changes and much more not taken into consideration, although some will try to compensate for this by using fans etc. Torque is the turning force, in this instance we are talking about the turning force that will be applied to the driving wheels of the car, measured by the unit, pounds-foot (lbs-ft) or Newton-meters (Nm). A lb-ft of torque is a measurement used which represents for example the turning force at one end of a 1ft bar while at the other a 1lb weight is suspended. Therefore if you have a 200lb weight on the end of the 1ft bar, you will have 200lbs-ft of torque. Obviously as this number rises, the more turning force there is on the wheels. As you can see, torque will also be useful for those who like to tow things, as a heavy vehicle will benefit from that extra torque. Torque is a measure of the ability of an engine to do work (in an instance). However it is important to realize that as you increase the torque of your engine, hence increase the turning force of the driving wheels, you run the risk of just spinning your wheels. This is quite common on high powered front wheel drive (FWD) cars with lots of torque. With the front wheels also designed oddly enough to steer the car you will get something called torque steer, while you are turning your steering wheel and accelerating, you end up spinning the front wheels and not much happens with the steering either. Of course any high powered car with lots of torque will spin the wheels due the forces of nature (turning forces vs traction). By dividing that torque to all 4 wheels (4WD) you can reduce the spin of a high torque car and transfer the power to the road better, hence EVOs’, Imprezas’ and Skylines’ etc tend to be able to pull away from a stand still quite well, although there are many more factors that can help a FWD or rear wheel drive (RWD) car to put that power down effectively, such as tyre size/compound, suspension/chassis setup and gear ratios. Again this subject confuses the hell out of people, even those like me who know a thing or two about cars. So again I’m not going to describe silly confusing scenarios etc. The problem with the quoted power figures from manufacturers is that they tend to quote peak horsepower figures. This leads to confusion when people talk about comparing cars performance with horsepower as a measure. “My car has x amount of horsepower so will be faster than your car”, isn’t an accurate measure of your cars performance. There are many factors involved in a cars performance and torque is certainly one of them. It’s also important to realize that the effect of power, be it horsepower or torque will also be affected by other components, such as gear ratios, either the gearbox or final gear ratios and of course it all depends on the application the car is going to be used for. If you have ever driven a high torque car, you will have noticed that you are able to accelerate with ease in most gears (large engined cars and Turbo Diesels for example). This is because there is sufficient power in the form of torque to move the car at a much lower and wider rpm range than a car with much less torque. Acceleration is directly proportional to the torque put through the wheels. Therefore the car will accelerate in relation to the torque curve. However if you use a numerically higher gear ratio to produce more torque, you actually decrease the maximum speed that the gear can rotate at. This could lead to a high torque car say putting out 500lbs-ft of torque for example, maxing out at 20mph in 1st gear and running out of revs much earlier, bringing the in gear and top speed down. With all this talk about torque, no pun intended, let me just mention that horsepower is just a different way of that power being measured, this time over a given distance, i.e. with torque multiplied by the revolutions per minute divided by the constant 5252 (see equation above). However an engine can be designed to produce higher rev limits and higher horsepower and by changing the way it is geared create more torque through the wheels. What we’re trying to get at here is that horsepower and torque are related to each other but in different ways. A higher torque car will accelerate differently than a higher horsepower car, with different shift points, gearing and rpm ranges. Lower torque/higher horsepower cars tend to rev much higher and produce their power higher up the rev range. Higher torque/lower horsepower cars tend to make their power lower down the rev range but over a relatively wider rpm range. All very confusing as they are the same thing, but accelerate the car in different ways. A good car will have a nice mix of torque and horsepower with the appropriate modifications to enhance both. This dyno read out clearly shows good torque available low down in the rev range and then maintaining a good consistent reading throughout the rest of the rev range. 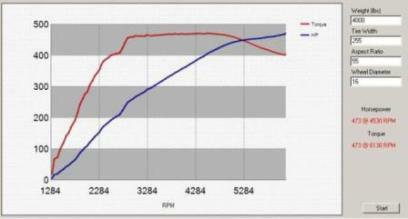 Coupled with a nice evenly increasing horsepower curve, this engine would make a nice car to put the pedal to the metal. Although that all depends on the gearing and application. Overall it has a good horsepower and torque curve. Final Word – We hope we haven’t confused you with this horsepower and torque article. Just remember this; the best accelerating car will have an engine that can produce the highest average power over the longest rev range. VVTi engines do this well for such small engines, with varying the valve timing to optimise the power at variable rpm ranges (2). It doesn’t really matter whether it’s a high torque or a high revving car, as there are many more factors that will affect its performance, but find one that does both, then your laughing (anyone for a race engine, oops it only lasted 100 miles). Ok, we’re again not going to give you the boring technical bits here, let me quantify something here, your engines torque is affected by your gears, the engines torque is multiplied by the gearing used. It is possible to get a low torque engine to produce a high torque figure at the wheels by altering the gearing, therefore your transmission or final drive ratios will alter the engines rev range and how that torque is used (do not under estimate this). A V8 and Vtec produce torque differently through gearing and the way the torque is produced by way of engine design. With that out the way, the interesting part – as mentioned before a good accelerating car will produce a good torque curve that is spread over the widest rev range (the highest rpm range that you can maintain torque will be your peak horsepower figure). To get the most out of your car, you will need to know what your power curve looks like and at what rpms within each gear. Also you will need to know what rpm you will drop to when changing up a gear (or even down). This will tell you what the torque figure is, at a certain rpm range in all the gears. Your car will accelerate hardest at peak torque, however as you move up a gear, your rpms will drop and the torque will drop. The trick is to find out at what rpm to change that gives you good torque in the next gear up, without dropping off too much in your present gear. This will all depend on the car you are driving, but as a general guide, if your car produces its max torque at 4000rpm, you do not want to change up a gear at this point, as you will more than likely drop too far down the rev range for the next gear to have enough torque to accelerate very fast, as a general guide most cars will be better going towards just under the redline for max acceleration (watch touring cars and other race cars for their shift point indicators on the dash). Pre 1972 American car engine power = gross horsepower. Measured using a blueprinted test engine running on a stand without accessories, air filter, exhaust system, or emissions control devices and sometimes fitted with “test Manifolds”. The resulting gross power and torque figures therefore reflect a maximum theoretical value and not the power of an installed engine. Post 1972 American car engine power = net horsepower. Complete and installed engine, it measures engine power at the flywheel, not counting transmission losses (or anything after the flywheel). Remember – American cars use their large CU engines “torque” to provide the performance from their cars. Brake horsepower (bhp) is the measure of an engine’s horsepower on a dynamometer. It is measured at the engine’s output shaft (crankshaft – which is connected to the flywheel). The final figure arises from the engines torque being used to calculate the bhp. The confusion comes from people talking about cars being dyno’d and quoting figures for corrected (losses taken into account) and WHP (wheel horse power – measured at the wheels). Visit the power conversions page to convert power ratings.